When was Jensen Moving & Storage founded? To schedule your upcoming move you can call (772) 334-5787 or email us with your intended move date. There is no deposit necessary to schedule. What's involved with getting an in home estimate? In-home estimates are a free service we offer! 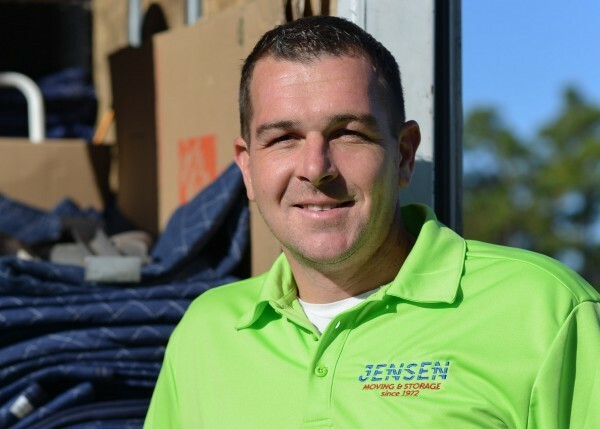 A representative from Jensen Moving & Storage will come to your home and do a walk through with you. At that time, feel free to ask any questions and concerns you may have. Jensen Moving & Storage will explain the moving process, give pointers on how to pack, wrap and organize to make your moving day a breeze. After the walk through is complete we will give you options on your move and an estimated time/cost with each option. Packing, unpacking and storage is available. How far in advance do I need to let you know before I book a move? We recognize that it is not always possible to know exact dates very far in advance. Although it is preferable that you reserve your move date with us as far in advance as possible, we do specialize in accommodating last minute moves into our schedule. That being said, don’t be discouraged from giving us a call to book your move because you think that it may be too late. It’s very likely that we can get you on! Are there any hidden fees for fuel, mileage, weight, etc? We like to keep it simple. There are no hidden fees. Our billing is done strictly by the hours it takes to relocate you. 100% satisfaction guaranteed. Absolutely not. All of our guys are professional full time staff, some of whom been with us for over 12 years. Furthermore, all of our movers are required to undergo warehouse training before we send them out on a truck. Under no circumstances do we send out day laborers, ever. What other services do you offer than moving? In addition to moving, Jensen Moving & Storage offers a humidity-controlled warehouse storage facility where our customers may store their items for a period of their choice. We also offer packing services, the selling of packing materials and custom luxury automobile and high-value item transport services. We accept cash, personal check, money orders or credit/debit cards (except American Express) upon completion of the move. Nothing is due for moving services until the end of the move. Do you pad and wrap everything? The majority of your items will be wrapped. We wrap to prevent damages,hold drawers shut and strengthen items to be moved. Once on the the truck everything gets padded. Our moving blankets provide additional protection for your items during transit. Although our team is extremely careful, damages can occur. We offer standard coverages for no additional cost. We have additional coverages available for all your needs including art, cars, storage with additional value coverages. Yes. Our movers license number is M2401 and we are fully insured. If you need to have an insurance certificate on file please contact us with the complaint name, contact person and their address so we can send it right over to them. What are my options for additional insurance? Relocationinsurance.com is our vender for addition moving coverages. They offer a variety of specialty coverages for your most cherished belongings. I have more/less items being moved now? What should I do? Being as we have zero hidden fees, adding or subtracting items can be done easily. Assess the item on its weight/size and see how long it would take you to carry the item to the place we are able to park our moving truck(s). That will be a good idea on your cost change. Call for any additional items you may want moved and we will secure a price quote for you. Do you have more then one customer's items on a single truck? No. One truck per customer meaning the crew and truck is yours for your special relocation day. The majority of your items will be wrapped. We wrap to prevent damages, hold drawers shut and strengthen items to be moved. Once on the the truck everything gets padded. Our moving blankets provide additional protection for your items during transit. We offer full packing services, partial packing, unpacking service & storage. You can order packing supplies from us if you need them. What unpacking options do you offer? Can I leave items in my dresser draws/desks drawers, filing cabinets? When moving furniture lighter is better. However, if you are ground level it is okay to leave light clothing in the drawers. You want to remove any breakable items from the drawers that may shift during transportation. What am I NOT allowed to move with Jensen Moving & Storage? Propane tanks, liquid chemicals, flammable liquids, live potted plants, any combustible substances or firearms of any kind. I'm taking my appliances, do you disconnect and reconnect them? Although appliances are easy to disconnect, we are unable to do so. During your move the crew can assist you in disconnecting by moving the items away from the wall for you to gain access. Our crews are equipped with the correct tools for you to disconnect and reconnect. "Great job, fast and efficient"